Multilane Mini SAS Data Cable directly connects a RAID or PCI Express controller to the SAS backplane of a hard drive bay in a server or workstation; Internal, multilane cable with Mini SAS 8087 connectors is used for mass storage interconnection between a SAS controller and a SAS/SATA drive enclosure in a workstation or server. 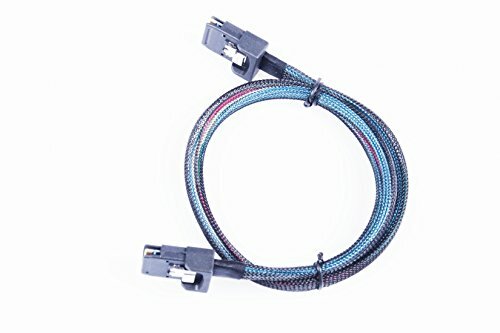 4Lane, high performance internal Mini SAS 4i cable; Supports SAS 3.0 12 Gbps performance with compatible SAS or SATA storage systems and hot-swappable SATA/SAS drive bays. DIY or IT pro Installers both appreciate the convenience of a heavy duty but flexible cable when expanding storage needs; Mesh harness of internal Mini SAS 36 pin cable is easy to route in tight spaces; Supports SGPIO feature over integrated internal sideband wires when connected to a managed backplane; Ideal component of a professional SAN network. Robust Design of HBA Host to Target cable includes an industrial grade woven mesh sheath over the individually shielded ribbon cables, cloth tape strain relief to protect the cables without rigidity, and sturdy 36 pin SFF 8087 connectors with stainless steel latches to ensure a solid connection. SFF-8087 COMPATIBLE with popular RAID cards such as 3Ware 9650SE-8LPML RAID, Adaptec ASR-5805/512MB SAS RAID / 2258200-R 5405 RAID / 2258500-R 51645 RAID, Dell PERC H700 Raid / PERC H200, Dell PowerEdge 8-port SAS SATA Controller / PERC H310, HighPoint RocketRAID 2720 / RocketRAID 620 / RocketRAID 4520 / RocketRAID 4522, LSI Logic SAS9211-8I HBA Card, StarTech.com PCI Express RAID, Syba 4-Port RAID HyperDuo / PCI Express SATA II 4 x Ports RAID, Supermicro AOC-SAS2LP-MV8 8-Channel SAS/SATA Length:1.64ft(0.5m). 6GbpS * 4 Lane four channels of data transmission. Tip :If you have any questions or need help, please contact us，communication can solve many problems.